Mossievale Guest Cottage Elsie and Chippie Joseph are waiting to pamper you. From their scrumptious picnic baskets to their caring Karoo hospitality, this is one holiday decision you’ll never regret. The quaint self-contained house dates back to the earlier days of Graaff-Reinet and has been declared a national monument. 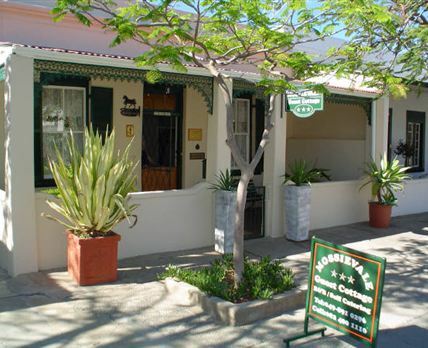 Situated on a quiet tree-lined street, Mossievale is only a short walk away from the heart of historic Graaff-Reinet. The peaceful garden offers lovely mountain views, barbecue facilities and a sparkling pool. Fully equipped for up to nine people, the cottage is available for both self-catering and B&B guests. All three bedrooms feature ceiling fans and there are two air-conditioners. Recently, a backpacker’s unit was also added to cater for those travellers that need only a bed to sleep in and a bathroom to freshen up. Mossievale is ideal for a refreshing overnight stop or as a relaxing holiday house for a longer stay. Click here to enquire at Mossievale Guest Cottage.